A concert movie on an unprecedented scale. Rattle and Hum captures U2 - on and off the stage - during their triumphant Joshua Tree tour. From the giant technicolor stadium celebrations to the black-and-white intensity of the indoor shows, this is U2 at their best. Follow the group across America, exploring new influences, playing with the legendary B.B. King, on a journey which takes them from Dublin to Graceland, from San Francisco to the streets of Harlem, from The Joshua Tree to Rattle and Hum. DVD: Widescreen 1.85:1/16x9; audio English DD 5.1 & Dolby Surround; subtitles none; closed-captioned; single sided - single layered; 20 chapters; rated PG-13, 98 min. ; $29.99; street date 11/23/99. Hindsight really is always 20/20, and in retrospect, serious U2 fans such as myself can observe how overblown and self-involved the band had become by 1988. After all, they spent 1987 receiving their official coronation as the Biggest Band In the World, and the guys had always been rather overly serious anyway. After the enormous success of The Joshua Tree and the ensuing tour, they simply became a little too enamored of themselves and received a mild public spanking for which they probably were due. 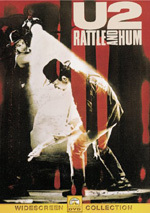 That small rebuff from the public and the critics occurred during the promotional blitz that accompanied their 1988 album and film releases, both of which were titled Rattle and Hum after a line in their song Bullet the Blue Sky. These two works documented the 1987 tour to some degree but they also showed us U2's attempt to incorporate more "rootsy" aspects of American music into their repertoire. The songs themselves were pretty decent, though generally not up there with the band's absolute best, but there was something about the excessive reverence the guys displayed and their pretentiousness that just started to come off poorly. It's ironic, I suppose. U2 gained a lot of popularity because of their attitude of seriousness; they were about something. However, they began to slip into the territory of self-parody by the time of Rattle and Hum and it's likely a good thing that they saw the reactions they inspired; this slight falling-out allowed them to rethink themselves and come back with the radically different vision of the band seen in the Nineties through the Achtung Baby and Pop albums and each subsequent tour. It's fairly astonishing that the group could reinvent their public personae and still succeed, but that's what happened, and this success seems oddly indebted to the relative failure of Rattle and Hum. Don't get me wrong: it's not like folks turned on U2 in 1988 and really lit into the guys. No, it was more of a feeling that the act was getting a bit old and that it couldn't continue along those lines. While I don't doubt the sincerity of the boys in their interest in American music, there was something subtly arrogant about their apparent desire to teach us what they'd found, and it started to disenchant folks. As an album, Rattle and Hum works fairly well. It's split between live recordings of U2 songs and a few covers plus a good number of new tunes, all of which are on a level between competent and pretty good. The movie also attempts this hybrid form but does so less successfully. Let's put it this way: you know how many DVDs use the bogus technique of listing "Scene Selection" as a special feature? Well, you'll really value that capability when you pop Rattle and Hum into your DVD player because it's quite unlikely you'll spend much time watching anything other than the concert scenes. I hadn't watched the non-concert segments of Rattle and Hum for quite some time, and the truth is that they're not terrible. Some of the scenes show fairly dull interviews with the band - surprisingly, drummer Larry Mullen Jr. is the only member who comes across as possessing a personality - while others offer song rehearsals and various "impromptu" performances. The remainder of the movie shows actual concert shots. It's this hybrid nature of the film that makes it ultimately frustrating. Madonna is easily interesting and provocative enough to support a movie of this sort, as Truth or Dare clearly showed. Other acts - like the Stones or Led Zep in their prime - could also make a viable and entertaining picture of this sort. U2 aren't the right band for all the interviews and introspection. If the band had simply let go and allowed the movie to present simply concert footage, it could have been a roaring success. As it stands, it remains half of a great rock movie. Look at it this way: no one ever leaves Rattle and Hum thinking, "I wish we'd heard more talk from the boys!" Happily, the nonmusical portions of the film are fairly minor. I actually remembered there being more talk than there is; I doubt the interviews actually take up more than 15 minutes of the movie. Most of the concert shots are taken from an indoor show in Denver (nine of the fourteen songs) and from a stadium performance in Arizona (the remaining five tunes). The Denver scenes mainly occur during the first half of the film and are in black and white; once color kicks in with "Where the Streets Have No Name", it's all Arizona until the concluding performances of "Sunday Bloody Sunday" and "Pride (In the Name of Love)" revert to the Denver footage. A few other locales also appear. For instance, film-opener "All Along the Watchtower" came from a free outdoor show in San Francisco, "When Love Comes to Town" is from a Ft. Worth show at which B. B. King opened, and "I Still Haven't Found What I'm Looking For" takes place in a Harlem church where U2 are joined by a gospel choir. For highlights, I tend toward the material in the second half of the film. This is partly because these concert scenes are almost uninterrupted, whereas the songs in the first half featured more interviews and whatnot. Once "Where the Streets..." starts, we barely hear from the band, and that's a good thing, not just because they're not terribly interesting but also because it allows the music to gain momentum and create a flow that can be sustained. Plus, "Bullet the Blue Sky" remains the best song U2 have ever done, so that's gotta count for something! "Where the Streets..." and "With Or Without You" also feature superb renditions. I don't know if it's all that shocking, but I think it is surprising to note that Rattle and Hum marks the first DVD release of U2 material. Zoo TV Live from Sydney was supposed to appear in 1997 but never did, and 1998's Popmart Live in Mexico has yet to make the cut either. There's a wealth of other U2 video material out there, but who knows if it'll ever be released on DVD? Anyway, it's good that the ball finally gets rolling with Rattle and Hum. I'd much prefer to see Popmart Live since it's the only one that hasn't appeared on laserdisc, but what're ya gonna do? Better to look at the DVD as half full! The DVD of Rattle and Hum does mark something new for the film, as this is the first time it's been presented in its original theatrical aspect ratio of 1.85:1; all previous incarnations were fullscreen. The image is also enhanced for 16X9 televisions on this single-sided, single-layered DVD. While I generally prefer letterboxed presentations, the absence of a widescreen edition of Rattle and Hum wasn't any big loss because the previous versions offered fullscreen transfers that provided additional information at the top and bottom of the screen; no footage from the sides was cropped, whereas the letterboxed DVD actually cuts off the top and bottom of the picture. Again, that's what the director originally intended, so I like that, but seeing the movie widescreen wasn't exactly a revelatory experience. I had a very difficult time evaluating the look of Rattle and Hum on DVD because the quality varies radically throughout the film. As noted earlier, the majority of the movie is black and white; only 24 minutes of it are in color. Even within the black and white segments the film lacks consistency. All of the non-concert scenes display a tremendous amount of grain and look very rough. This appearance was clearly intentional in an attempt to provide that gritty "documentary" look. The black and white concert shots clean up the image substantially, though they also seem somewhat grainy at times. It's often hard to get a really good grip on the black and white concert footage because of the harsh, intentionally stark lighting used; it makes it difficult to accurately observe the quality of the image, especially because black levels often seem washed-out because the white lighting overwhelms them. When the brightness backs down, shadow detail and contrast seem quite good, but for the most part, the light takes over and creates a grayish, stylized image. The color scenes generally look pretty good, though they tend to offer a fairly monochromatic appearance as well due to more of that strong white lighting. What hues we see seem accurate. During "Bullet the Blue Sky", red lighting is used, and it appears concise and lacks any bleeding or blotchiness. The quality of the print used for the transfer seems generally adequate, but some flaws appear; marks and spots pop up from time to time. Due to the style of the photography, these aren't very intrusive, but they're there. Sharpness seems pretty good, though the grittiness of the film often makes the image appear a bit fuzzier than it should. Rattle and Hum is another one of those movies with an image that's hard to accurately rate because it's purposefully poor at times. I try to factor in the director's intentions but I don't want to mislead the reader into thinking an ugly film that's been transferred perfectly deserves an "A+" rating. Rattle and Hum has many image flaws, most of which are supposed to be there, and it earned a somewhat above-average rating because much of it actually looks pretty good. Better is the Dolby Digital 5.1 mix accorded the film. I've always found this track to be something of a disappointment for reasons I'll cover later, but it's really quite strong. The mix provides an outstanding front soundstage with a fantastic stereo presentation. Great detail is afforded the instruments and vocals and they all are placed discretely within the spectrum. Clarity is also terrific, with consistently crisp and concise audio. The low end seems somewhat weak at times, something that may be remedied to a degree by the addition of a subwoofer, but also a factor that may have been intentional; The Joshua Tree offered a very compressed sound, and that appearance occasionally seems replicated here, though not to the same degree. I'd prefer more bass, but this track really brings the music to life. The main disappointment I've always had with the Rattle and Hum 5.1 mix stems from the relative disuse of the rear channels. Prior to the 1995 release of this newly created track on laserdisc, the sound engineers discussed their intentions and they seemed to want to really take advantage of the discrete nature of 5.1; if I recall correctly, they mentioned using the rears to feature isolated instruments. U2 are a nearly ideal band for such a presentation because they're such a simple outfit; one guitar (though sometimes two), bass, drums, vocals and occasional keyboards - the various parts could be nicely distributed. That doesn't happen here. Indeed, the rear channels usually only offer crowd noise, a kind of "stadium echo" ambiance, and some filler percussion. I detected almost no use of the split surround capabilities; the only distinct occasion on which that occurred was for portions of "Bullet the Blue Sky". This lack of sonic ambition has always been quite a disappointment to me. Still, the audio really is quite good and it definitely is a tremendous step up from the flat and lifeless 2.0 mix also offered don the DVD. Rattle and Hum supplies very little in the way of supplements. Actually, only the (pretty good) theatrical trailer is on the DVD. This is a disappointment because there obviously must be a wealth of unused concert footage; it's about time that some of it appeared on video. The DVD case indicates that the disc "contains 11 songs not included on the album, U2 Rattle and Hum" but don't misconstrue that to mean that anything has been added to the movie itself; those songs were always in the film, but they didn't appear on the audio release. Rattle and Hum is a DVD that I'll recommend but just because I'm such a huge U2 fan. It's a no-brainer that someone like me will want this in his collection, as evidenced by the fact this is the fourth copy of it I've owned (VHS, LD, Dolby Digital LD, DVD). Owners of the previous Dolby Digital LD shouldn't bother with the change - I only did so because I got the DVD for $8 and expect I can sell the LD for at least that amount - but possessors of other incarnations will find it worth the cost. For less die-hard U2 fans, the question is more difficult, but I still think it's a good purchase. Rattle and Hum has its flaws - here they're called "band interviews" - but it still offers a lot of excellent music that's performed well and shown in an exciting manner than complements the act. Rattle and Hum makes for a nice addition to the collection of any U2 fan.